The spectacular beauty of Oregon leaves no visitor untouched. 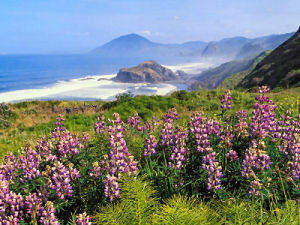 The state is home to deep vast forests, volcanic peaks, fertile valleys, plateaus, and an incredibly rugged coastline. To stand on one of the cliffs overlooking the Pacific is awe-inspiring, and the irony of the name Pacific is obvious when the ocean thrashes the beaches and rocks below. Oregon also is home to the deepest lake in America. With a depth of 1,932 feet, Crater Lake is a sight not to be missed. Deep, deep blue on a brilliant day, surrounded by the evergreen forest, Crater Lake is a uniquely wondrous and beautiful piece of Oregon's gorgeous terrain. The largest reserves of standing timber in the country contribute to Oregon's status as the leading producer of timber and plywood. The state has consistently attempted to balance the needs of the timber industry with environmental concerns. The origin of the name Oregon is not certain. One theory has it that the name comes from the French Canadian word "ouragan" meaning "storm" or "hurricane." It's thought that the Columbia River was at one time called "the river of storms" by Canadian fur traders plying their trade in the area. Another suggestion is that the name of the state came from the Spanish word "orejon" meaning "big-ear." This was a term that was applied to many Indian tribes in the area. A third idea suggests that the name of this state comes from the Spanish word "orégano" for the wild sage which grows so vigorously in eastern Oregon. Oregon is called "The Beaver State" because of the association of beavers with the early history of the state and because of the admirable qualities of intelligence, industry, and ingenuity that are associated with this animal. The beaver is the official state animal and is displayed on the Oregon state flag. Anyone who's been to Oregon will surely understand that this nickname comes from the amount or rain that falls in the state, most of it in the western 1/3 of the state. Precipitation can average from 40 to more than 180 inches a year in some areas. or "The Land of Hard Cases" was a nickname that was given to Oregon because of the hardships encountered by early settlers in the area. Oregon was called "The Sunset State" because of its far west location. At the time Oregon joined the Union, in 1859, it was the most westerly of all the states. This position was lost when Washington joined the Union in 1889 and again when Alaska joined in 1959. People who live in Oregon or who come from Oregon are called Oregonians. The State of Oregon is honored with the third quarter to be released in 2005, and the 33rd in the United States Mint's 50 State Quarters® Program. On February 14, 1859, Oregon became the 33rd state to be admitted into the Union. Its coin design features a portion of Crater Lake, the deepest lake in the United States, viewed from the south-southwest rim. The design incorporates Wizard Island, as well as Watchman and Hillman Peaks on the lake's rim and conifers. The coin bears the inscription "Crater Lake." Crater Lake is a unique and stunning natural treasure, formed more than 7,700 years ago by the collapse of Mt. Mazama in what is now southern Oregon. At 1,949 feet, it is the deepest lake in the United States and the seventh deepest in the world, and has a record clarity depth of 134 feet. The main cause of Crater Lake's remarkable clarity is its isolation from incoming streams and rivers. President Theodore Roosevelt established Crater Lake National Park in 1902, with the lake itself as the Park's crown jewel. It is the sixth oldest national park in the country. Since its creation, Crater Lake National Park has helped protect both the Native American cultural ties to the area and the natural habitat of the animal and plant life that lies within its boundaries. On May 24, 2004, Governor Ted Kulongoski endorsed the recommendation of the 18-member Oregon Commemorative Coin Commission by forwarding the Crater Lake design to the United States Mint. Other themes considered by the Commission and the Governor included an historical theme featuring the Oregon Trail, Mt. Hood with the Columbia River, and a wild Chinook salmon. 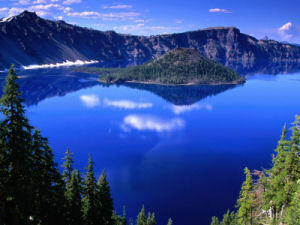 The Department of Treasury approved the "Crater Lake" design on July 13, 2004. Crater Lake National Park: Website of Crater Lake National Park from the National Park Service. Crater Lake is located in Southern Oregon on the crest of the Cascade Mountain range, 100 miles (160 km) east of the Pacific Ocean. It lies inside a caldera, or volcanic basin, created when the 12,000 foot (3,660 meter) high Mount Mazama collapsed 7,700 years ago following a large eruption. Oregon (From Sea to Shining Sea) , by Terry Miller Shannon. 80 pages. Publisher: Scholastic Library Publishing (September 2003) Reading level: Grades 3-5. 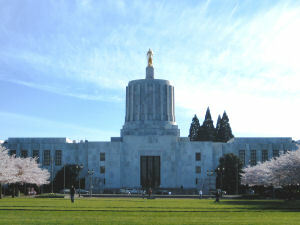 Presents information about Oregon's people, geography, history, landmarks, natural resources, government, state capitol, towns and cities, and more. Oregon (World Almanac Library of the States) , by Scott Ingram. 48 pages. Gareth Stevens Publishing (August 2002) Reading level: Grades 4-6. Filled with the most up-to-date information, including the latest Census results. Full-color photos bring to life the story of Oregon. In addition to an in-depth factual profile of Oregon in the form of a state Almanac, this book offers fascinating and lively discussions of the state's history, people, geography, government, economy, culture, and lifestyles. A section on Notable People, a calendar of events, and enough primary source documents, time lines, maps, and other tools to make this unquestionably the best young adult reference material on the USA available anywhere. Oregon Almanac: Facts about Oregon , by Andrea Jarvela. 240 pages. Publisher: Westwiinds Press (June 1, 2003) The Oregon Almanac is a must-read for visitors and residents alike. Packed to the gills with fact-filled bits of information and trivia, this almanac promises to be an unending source of entertainment for the inquisitive and the curious at heart. The Oregon Companion: An Historical Gazetteer of the Useful, the Curious, and the Arcan , by Richard H. Engeman. 432 pages. Publisher: Timber Press (March 25, 2009) What's the connection between Ken Kesey and Nancy's Yogurt? How about the difference between a hoedad and a webfoot? What became of the Pixie Kitchen and the vanished Lambert Gardens? The Oregon Companion is an A-Z handbook of over 1000 people, places, and things. From Abernethy and beaver money to houseboats, railroads, and the Zigzag River, an intrepid public historian separates fact from fiction -- with his sense of humor intact. Entries include towns and cities, counties, rivers, lakes, and mountains; people who have left a mark on Oregon; industries, products, crops, and natural resources. Includes more than 160 historical black and white photos. This entertaining and delightfully meticulous compendium is an essential reference for anyone curious about Oregon. General History of Oregon , by Charles H. Cary. 968 pages. Publisher: Binford & Mort Publishing; 3 edition (June 1971) This unique volume is recognized as the standard reference authority on the Oregon Country, offering the greatest fund of Northwest historical information ever presented in a single volume. From the 15th century through early statehood, it is the record of every significant historical event, social force, and trend in the vast area known as the Oregon Country. Index. Chapter notes and References. Maps. Photographs. Oregon Story: 1850-2000 , based on series published in The Oregonian . 144 pages. Publisher: Graphic Arts Center Publishing Company (August 5, 2000) Beginning in 1850 (when Oregon was only a territory), past the conflicts of wars both civil and international, and on to the new millennium, The Oregon Story: 1850-2000 unfolds, bringing the past into the present. The historical photographs and engaging stories in this unique and splendid volume focus on the Oregonians who were significant in shaping each decade, and give a detailed and evocative account of what life was like in each period of Oregon's modern development. See the city of Portland grow from "Stumptown" into the jewel of the Willamette. Hear about men who lost everything in the Depression, yet gave us our priceless legacy in Timberline Lodge. Based on an intriguing illustrated series of articles called "An Oregon Century" in The Oregonian , this expanded history spans the existence of the Northwest's largest newspaper, the oldest continuously operating business in Portland. This fascinating look at a remarkable state, rich with photographs, facts, and timelines, will enable you to know and enjoy Oregon as you never have before. Roadside History of Oregon , by Bill Gulick. 430 pages. Publisher: Mountain Press Publishing Company; 1st edition (June 1, 1991) This volume takes the reader through time, from Lewis and Clark's journey along the Columbia River to pioneer town-builders at the end of the Oregon Trail, from the tenders of lonely lighthouses off the storm-wracked coast to the Chinese miners working the depths of Hells Canyon. "Once in a while a travel/history book comes along that truly grasps the reader's attention and fires the imagination. Such a book is "Roadside History of Oregon". . . . It makes for fascinating reading."